I was expecting a package and tracked it online. The company sent it via FedEx (good) but FedEx only delivered it to my local post office, not to me (bad.) UPS has the same stupid service and I complained about it before. WHY would you hire an outside company to do ¾ of a job? Would a baker measure and mix all the ingredients of a cake and then send it to some other bakery to put in their oven? Would you hire Tom Hanks to star in ¾ of a movie and replace him with Adam Sandler for the last half hour? I just don’t get it. Finding a dumb picture of Adam Sandler is ridiculously easy. So I went to my post office to complain. I brought the print out from the USPS website. It had the tracking number and whatever other information there was. And knowing that they’d ask, I wrote my name and address on the sheet. I’ve been through this before. The last time I was there the moron (sorry, no more Mr. Nice Blog) searched for 20 minutes to find my package, only to come back and ask for more information. The information turned out to be right in front of her. This time, after 20 minutes of searching, the same moron came back again for- you guessed it- more information. You see, having the tracking number, sender, and my name and address simply wasn’t good enough. The information she wanted would surely crack this case. It was my first name. Stupid me, I only wrote my last name on the paper, thinking it would be enough. C’mon, am I seriously to believe that if she came across a box from the correct sender, with the correct tracking number, the correct address, and my correct last name, that she wouldn’t believe that was my package without my first name? As I said, this woman is a moron. And at any rate, the package wasn’t there, first name or not. The “fill-in” supervisor, who seems to be a permanent full-time fill-in since he’s been there every time I have, says they don’t have it. But they did have it at one time. They have a picture of the package as it passed through some machinery. And here’s my problem. The picture clearly shows that the label says “Carrier: Leave if addressee not home.” I have no idea why anyone would put that there. In fact, my post office almost never leaves me my packages. I get a slip and I have to pick it up at the post office. This situation with the lost package is exactly why I don’t want anything left. But my argument is that it wasn’t left by my door or even by my mailbox. We have a new mailman who has been leaving packages for my building in a wide open, unsecure lobby. So I am sure that someone just walked by and grabbed it. So everyone involved has an excuse and apparently no one is to blame, and the mailman will never admit where he left it, so I’m out $15. Not a big sum, but it’s my money and I don’t want to waste it. The “fill-in” had only one option: file a claim on their website. You’d think you could file a claim with the post office at the post office, wouldn’t you? Oh, you silly goose, of course you can’t! Why would they make anything easy? Or logical? 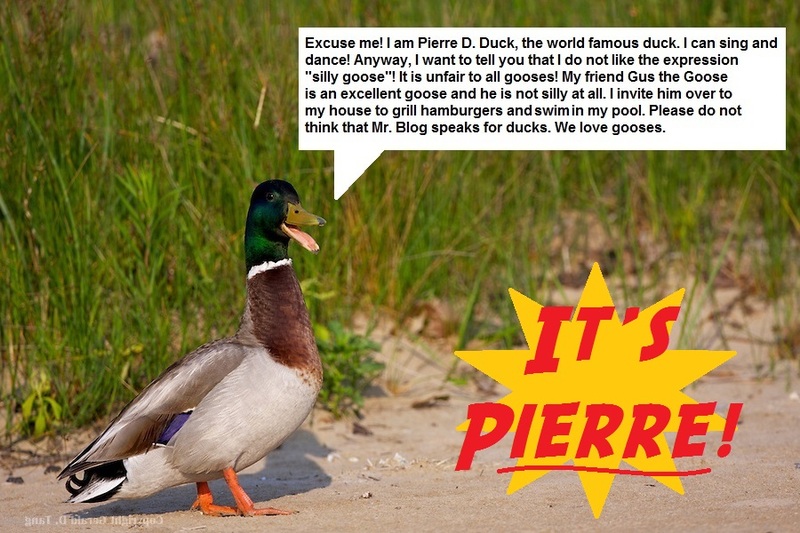 Like Pierre D. Duck on Facebook! Their website made me register and even though it claimed that my email was already registered, it also claimed that they could not give me my log in info because they could not verify the email address. To repeat, they could not verify the address they claimed was already registered on their site. What the F? So I registered with a different name and gave all kinds of info down to and including, I think, my shoe size. Then the tracking number I had, which I used before to track the package, suddenly wasn’t good enough, and I had to find the exact date it was shipped. After a lot of nonsense they told me that I couldn’t file a claim since I didn’t buy insurance. It was a lousy $15 order! The website never even gave me the option to buy insurance. The post office lost my package and won’t do a thing about it. So I went back to where I placed the order, ready to bite the bullet and buy another item, but now the discount code I used has expired and the $15 purchase now will cost me $37. Luckily I found a promo code online and brought the price down to $27. Of course, the reality is that the product is now costing me $27 plus the original $15 I lost, meaning I spent $42 instead of just $15. Meanwhile, after I placed my new order, I heard back from the company. I had a day or so back told them the package was lost and could they do anything about it? They said “we’ll send you another right away.” No charge, no questions asked. So it’ll still cost me $42, but at least I’ll get double my order. So what did I order to begin with? Three customized Mr. Blog mousepads. And now I have six. I am afraid that I must inform you the order has been returned to us by the postal system, due to being damaged in transit. This damage has resulted in the condition of your title being unacceptable to re-send. I am starting to take this personally. Wait ’til the Amazon hovering drones start delivering packages. Should we welcome a bunch of aerial robots ( Bearing gifts ), or be wary ? I’m looking forward to the new sport- shooting down amazon drones. Rednecks in the country, youth in the inner city, either way, flying valuable goods in low altitude dangling from the bottom of a drone is a recipe for a lot of people to try for free flying Kindles. I am totally serious when I say that drone delivery will be a total disaster, for more reasons than just fools with shotguns. It’s really just a fad and I hope Amazon is just bandwagon-jumping for publicity.